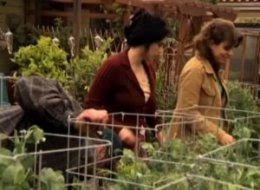 In this video, KVIE profiles Jules Dervaes, a man who has turned his small suburban yard into a profitable organic farm. Dervaes says what started out as a hobby became serious for him with the advent of genetically modified foods and rising food prices. With the help of his family, they now produce over 6,000 pounds of food annually on their 1/10-acre land, though their goal is to hit 10,000 pounds. The 350 varieties of organic fruits and vegetables grown not only sustain the Dervaes family, but the large surplus is sold to local restaurants and catering companies. Setting an example as to what's possible in city farming and sustainability, the Dervaes family even makes their own bio-fuel for their minimal vehicle usage. This is a cute animation, that demonstrates an important fact about how you can grow MANY FROM ONE! 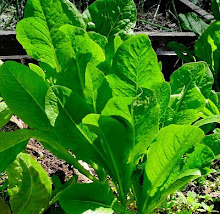 In these days of worries about food security and hunger or just fresh food availability and food safety from tainted food products in stores, we can all grow some fresh, nutritious, wonderful tasting organic food. Three years ago the U.S. Senate’s unanimous approval and designation of the final week in June as “National Pollinator Week” marked a necessary step toward addressing the urgent issue of declining pollinator populations. In just three years Pollinator Week has grown to be an international celebration of the valuable ecosystem services provided by bees, birds, butterflies, bats and beetles. The growing concern for pollinators is a sign of progress, but it is vital that we continue to maximize our collective effort. The U.S. Secretary of Agriculture signs the proclamation every year. Pollinating animals, including bees, birds, butterflies, bats, beetles and others, are vital to our delicate ecosystem, supporting terrestrial wildlife, providing healthy watershed, and more. Therefore, Pollinator Week is a week to get the importance of pollinators’ message out to as many people as possible. It's not too early to start thinking about an event at your school, garden, church, store, etc. Pollinators positively effect all our lives- let's SAVE them and CELEBRATE them! The Pollinator Week Kit is filled with fliers, recipes, stickers and more for your NPW event. Many states require that one of their citizens request that events such as Pollinator Week be officially proclaimed. In 2009, 36 states officially declared Pollinator Week! Do you have a National Pollinator Week event you'd like to post on the Pollinator website? Send an email to info@pollinator.org with the subject title "Post My NPW Event". Also, send pictures after the event is complete to post! ROME, May 22, 2010 (IPS) - When people talk about biodiversity loss, discussion often centres on the tragedy of animals like the tiger and the panda being in danger of extinction. It is as if the world were about to be deprived of precious parts of its heritage, perhaps comparable to works by Mozart or Shakespeare - sad yet not something that will affect our everyday existence. Unfortunately, this widely held vision is misguided. Biodiversity loss is a massive threat to human food security and, ultimately, to our species' survival as well as to that of the millions of plants, animals and bacteria which share the planet with us. "Biodiversity loss is not just a question of landscapes and species protection, it's also about agricultural issues upon which we rely to grow our food," Marco Contiero of Greenpeace told IPS. "It's about us." The Rome-based Bioversity International research institute has organised a week of events in the run-up to Saturday's World Biodiversity Day - in 2010, the United Nations International Year of Biodiversity - and one of its main objectives is to highlight the link between agricultural biodiversity and food security in a context of climate change. The biggest problem climate change is expected to cause for food security is a predicted increase in extreme weather, which will put crops under a number of different stresses. This means that even if technology gives farmers a solution to one stress, for example with a genetically-modified drought-resistant organism, this crop is in danger of failing when faced with another, such as excessive rainfall or an unseasonably cold snap. To make matters worse, climate change is expected to hit hardest in areas already highly exposed to food insecurity, such as sub-Saharan Africa and southern Asia. But biodiversity can provide the answer in various ways, experts say. Firstly, having a variety of crops in a field gives farmers an 'insurance policy', as it raises the chances that at least part of the harvest will be able to withstand the stresses that arrive, something that is not the case with industrial monoculture farming. This might mean that farmers produce less in one particular year, but it should ensure higher output over the medium term, according to several studies. Species diversity also reduces the threat of pests and diseases, simply by diluting the availability of the potential hosts, and improves soil fertility, therefore reducing the need for expensive and environmentally damaging herbicides, pesticides and fertilisers. It is important for the nutritional side of food security too. The U.N. Food and Agriculture Organisation says that over one billion people are hungry, three-quarters of whom are rural poor in developing countries, but the number who are malnourished because of poor diets is a lot higher. "Poor farmers don't have any reserves and biodiversity is the main tool they have to manage risk. So we need to look at a very different approach to agricultural diversification, one that is based on the use of diversity," Bioversity International’s director general Emile Frison told IPS. "There are multiple benefits that can be derived from this, not just from a point of view of a more sustainable agriculture, but also in terms of the advantages of having diverse agriculture, which leads to diverse diet. This is essential for good nutrition and health. This is becoming an extremely important problem in many developing countries." And, crucially, crop diversity also enables farmers to see which plants adapt best to changing climatic conditions and adjust their practises to evolve with the local impacts of the greenhouse effect. This is why reversing biodiversity loss is not just an imperative for the two billion people in developing countries whose livelihoods depend on smallholder farms. While biodiversity faces many threats, including urbanization, deforestation and pollution, possibly the biggest drivers of its reduction are agricultural modernization and simplification of diets. 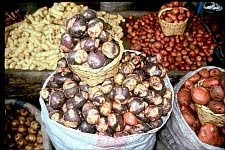 These have led to the current state of affairs in which the FAO says a dozen species provides 90 percent of the animal protein consumed globally and just four crop species provide half of plant-based calories in the human diet. As a result the food supplies of the well-fed populations of developed countries are increasingly vulnerable too, as agriculture has fewer and fewer resources with which to adapt to environmental challenges, such as climate change and water scarcity. "Studies show that if we keep losing biodiversity at the same pace as now, by 2050 we'll be confronted with an economic cost equal to 14 trillion euros," Contiero said. With FAO estimating that about three-quarters of the genetic diversity of agricultural crops has been lost over the last century, many believe the time has come for a radical change in the way we produce our food. "We need to have a different paradigm of agriculture, one that is not based on the fixed reduction of the agricultural model, which is what has been done with industrial agriculture, to one that is based on diversity," said Frison. There is still room for optimism, largely because smallholder farmers in developing countries are watching over much of the rich biodiversity that, despite everything, still exists. Therefore, the developed world should perhaps find ways to encourage them to continue doing this precious job, not just to help pull them out of hunger and poverty, but also out of self-interest.